The 1980s had more than their share of original Christmas songs. You hear them on the radio to this day, but something about them throws me right back to that goofy decade. Here are three. 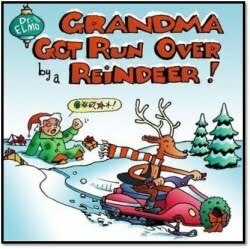 1) Grandma Got Run Over By a Reindeer. Best line: "You can say there's no such thing as Santa! But as for me and Grandpa, we believe." Aw, I love The Waitresses (Square pegs, square pegs, square, square pegs!). This song makes me a little sad, because lead singer Patty Donahue died in 1996 at age 40 after battling lung cancer for a year. Much too short a life. The song sketches out a story that everyone can relate to, really painting a picture. I have in my head the image of the exact store that the song ends in--to me it's a little neighborhood place behind my old apartment in Minneapolis. Not only catchy, but appears in the Christmas-set "Die Hard" (1988) as well as 1996's "Jingle All the Way." Talk about Christmas rapping. And now Rev Run is a reality show star. As a Midwestern white kid, I didn't know where Hollis was and never had collard greens, but chicken, rice, stuffing and mac and cheese sounded like a damn fine holiday meal. Mom's cooking chicken and collard greens. And Santa put gifts under Christmas trees." I was a DJ at my college's radio station in the early '80s when "Christmas Wrapping" came out. It was a B-side to one of their minor hits, as I recall, and I literally stumbled across the record by accident and played it just for the heck of it (one of the cool things about being a college DJ was that you could play anything you wanted that wasn't obscene). Naturally, I had no idea that the song would, like Wham's "Last Christmas" and the Eurhymics' "Winter Wonderland", become a holiday classic in its own right.